As of January 1, 2018, the demonstrated reserve base (DRB) was estimated to contain 475 billion short tons. 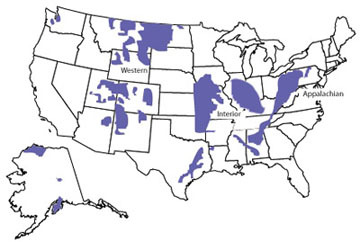 In the United States, coal resources are larger than remaining natural gas and oil resources, based on total British thermal units (Btu). Annually, EIA reports remaining tons of coal in the DRB, which is comprised of coal resources that have been identified to specified levels of accuracy. Between 1990 and 1999, EIA obtained updated coal reserves information and data largely through its Coal Reserves Data Base (CRDB) program. That program encouraged state agencies to revise coal resource and reserves estimates in their respective states. These revised coal reserves estimates include improved analyses of coal quality, accessibility, and recoverability in the study areas. EIA used these new data to revise the DRB. Recovery rates vary greatly between underground and surface mining. The actual proportion of coal resources that can be recovered from undisturbed deposits varies from less than 40% in some underground mines to more than 90% at some surface mines. In some underground mines, a portion of the coal is intentionally left intact as pillars to protect against surface collapse. Adverse geologic features in a mining area, such as folding, faulting, and inter-layered rock strata, can limit the amount of coal recovered at some underground and surface mines. Access to some coal is limited. Because of property rights, land use conflicts, and physical and environmental restrictions, EIA has estimated that only about 53% of the DRB may be available or accessible for mining. EIA annually estimates recoverable coal reserves by adjusting the DRB to reflect accessibility and recovery rates in mining. As of January 1, 2018, EIA estimated that the remaining U.S. recoverable coal reserves totaled more than 253 billion short tons, from a DRB of 475 billion short tons. Recoverable coal reserves at producing mines represent the quantity of coal that can be recovered (i.e., mined) from existing coal reserves at producing mines. These reserves essentially reflect the working inventory at producing mines. In 2017, the recoverable reserves at producing mines were 16.1 billion short tons. EIA conducts an annual survey, Form EIA-7A, Annual Survey of Coal Production and Preparation, to gather and report the quantity of recoverable coal reserves at producing mines.